I’ve been a huge fan of these absurdly sweet concoctions since I first encountered a variant of the diabetic-inducing delicacies in Sri Lanka. The first time I had it, I had a look of pure shock in my face from the insulin response. It delighted the Sri Lankan shopkeepers. The SHEER amount of sugar inside will astound you. 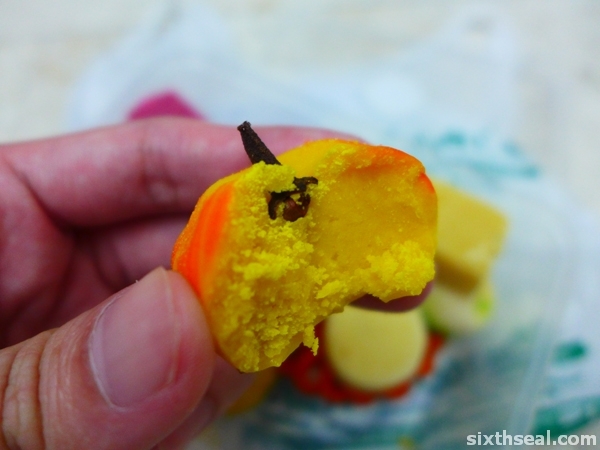 I recently found one a place in town called Bakti Woodlands that offer similar sweets. 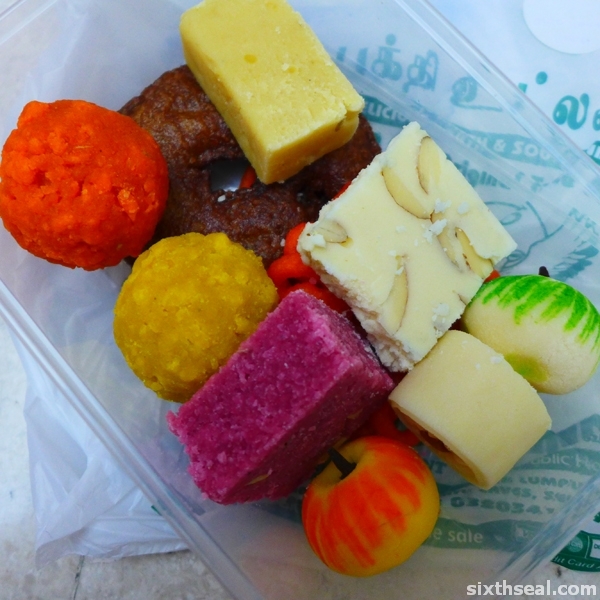 It called mithai and touted as South Indian in origin, but most are from the continental Indian area (most of the sweets are similar throughout the region, with just different names). They had a sample box of 10 different types of sweets for RM 10. I bought that and spent the night savoring the sweets and went back for more a few days ago. They didn’t have the boxes anymore – I was told that the sample boxes are only sold during festive seasons. I knew what I liked and what I didn’t so I bought it a la carte at RM 1 each. 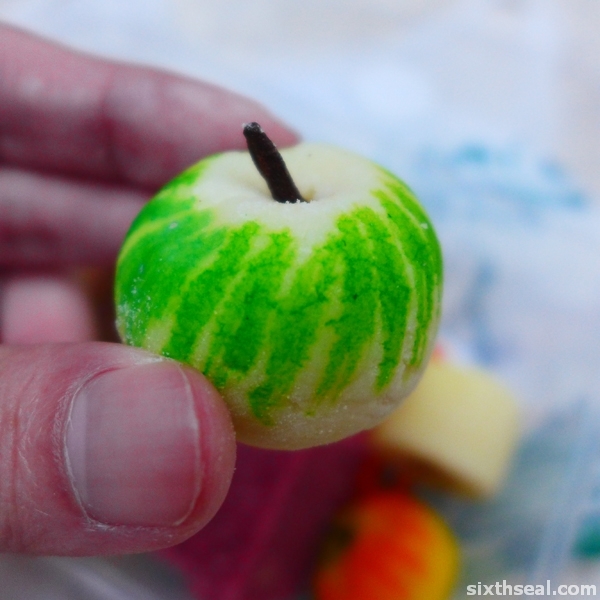 This is the most common sweet you’ll find around here. It tastes like a very light and fluffy doughnut and is made with urad flour and sugar before being deep fried in ghee (clarified butter). There’s a stall just beside Bakti Woodlands selling it for RM 0.70 instead of RM 1 but I find the former to taste slightly better. This wonderful slice of sweet heaven is made with a truckload of ghee, sugar and gram flour/dhall flour. The interesting thing about dhall flour is that it’s gluten-free, which means my niece can probably eat it. This is my second favorite mithai (Indian confection / sweet). The dude who was behind the counter didn’t recognize me at first until I brought up the topic of the sample box. He was intrigued and asked me if I was doing research. I wasn’t. Heh. I bought RM 30 worth the second time, and here’s the second video of him introducing the sweets – first one didn’t turn out right. 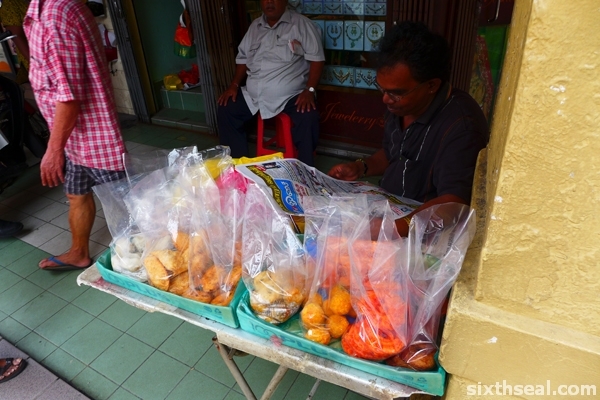 There’s a type of laddu that costs RM 2.50 (as opposed to RM 1 for the others, like the one above). 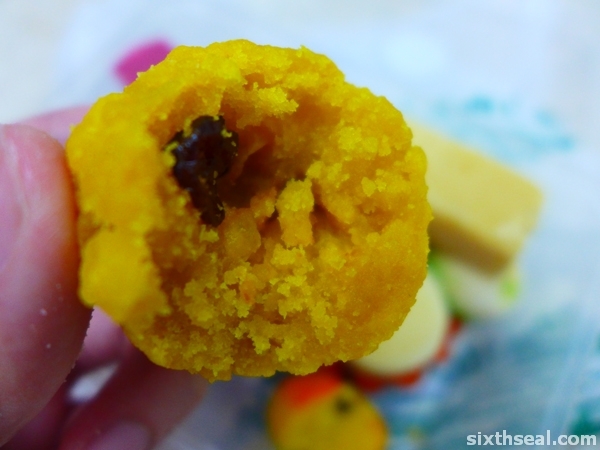 It’s a huge, fist-sized round ball made with brown sugar, cashew nuts and dried fruits. 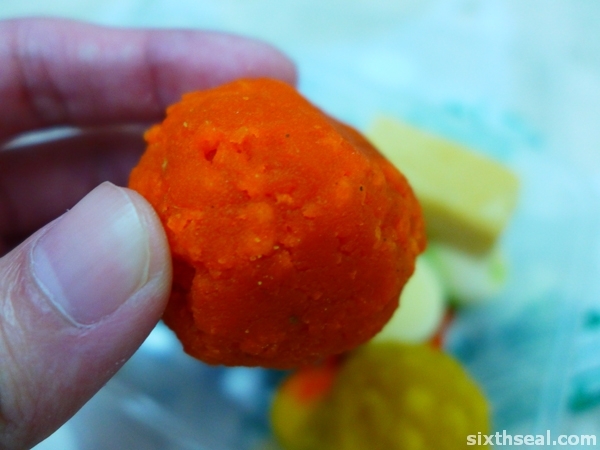 The word laddu means “small ball” and can contain almost anything. 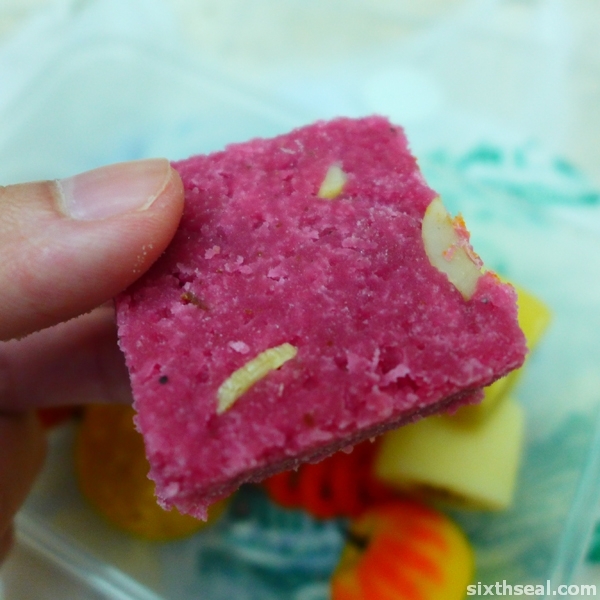 There are some with ground coconut (the red one) but I prefer the plain ones with raisins inside. This has gotta be my favorite mithai ever! Halwa is a very generic term that describes a lot of sweets across the Indian subcontinent and even to the Middle East. The name itself is Arabic for “sweet”. I first encountered it in Sri Lanka. I’ve also heard it referred to as barfi. for a tray of sweets. Heh. 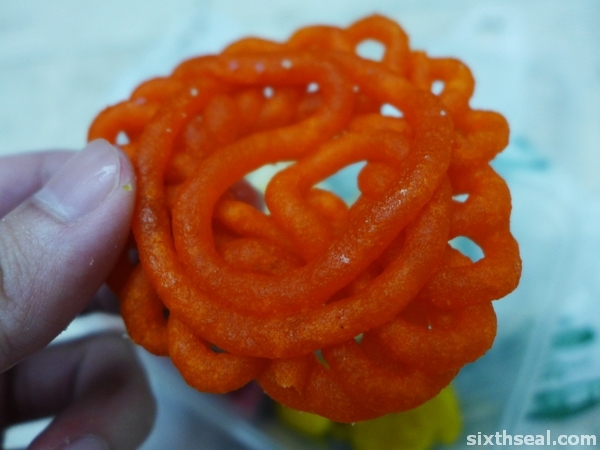 I once had one of these sweets after an Indian meal in France and I really have to admit, diabetic is an understatement! These things are REALLY sweet! Oh? I’ve always wanted to try buy I never did. Looks like it was a good thing I didn’t, not when they’re so sweet. What always put me off was the colours…and I would always to be too full after a heavy meal at one of these Indian places I would not be able to eat anymore. 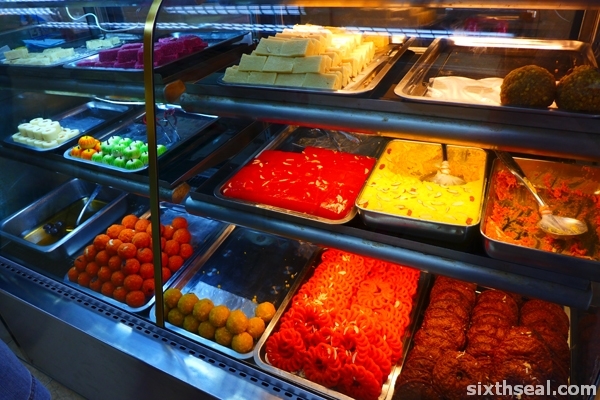 I don’t eat a meal at the Indian restaurants, I just buy the sweets – that’s what I want, it’s delicious stuff. Heh! Yeah, even some of my Indian friends said it’s really, really sweet. I love it to bits though. So much sugar…but I’m sure they’re very fragrant with all that ghee. Reminds me of kuih makmur (ghee balls) Hmmm…wonder whether I can get hold of some nice ones for the coming Chinese New Year….. Indeed! There’s condensed milk to contend with as well with some of the halwas. I was talking to an Indian today and he said even these sweets are too sweet for him. Haha. Yup! Those Malay layer cakes are ultra-rich and sweet too. They have all kinds of names for their layer cakes – I remember Holiday Inn. HB, those sweet look so nice looking also. In Berkeley, Ca across the bay it like Indian town there with lot businesses and restaurants. I go there to shop for silks to make things. Their shops have some sweet but not as nice as your in Malaysia. May they Southern Indians not Northern. 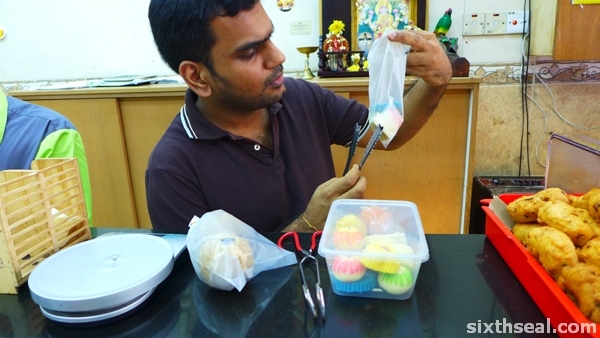 I think most of the sweets are standard across the Indian subcontinent – just different names. Some of them are even common across the Arabian peninsula. I know I’ve had them in Sri Lanka under a different name before (with regional differences, of course). I had the square one a long time ago but didn’t remember what it’s called. Halwa? 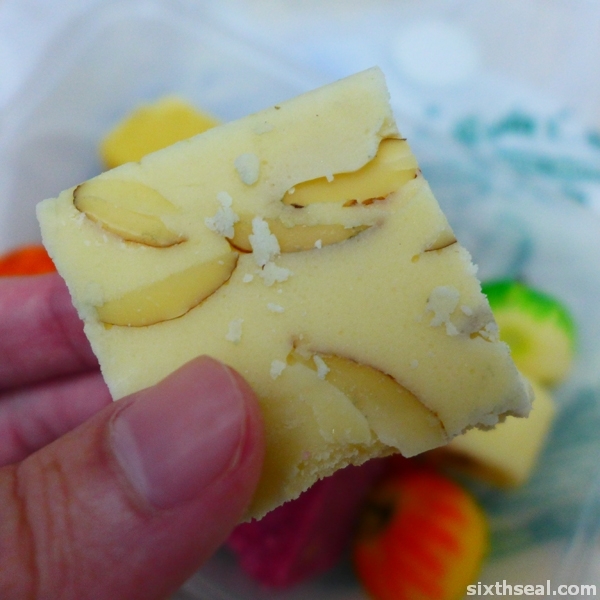 I think that’s a generic name for sweet, the square one that I like is called halwa anyway – white almond halwa. I think my brain went on vacation…lemme just correct that. It’s very, very sweet. Some of them don’t have spices in it though. …just milk, sugar and ghee. Delicious stuff! I have eaten some of these before and I think they are really too sweet for me!! A big no no for me haha! That’s why I love them…it’s such a shock to eat them the first time, each first bite. You get used to it after a while though so you have to stop. 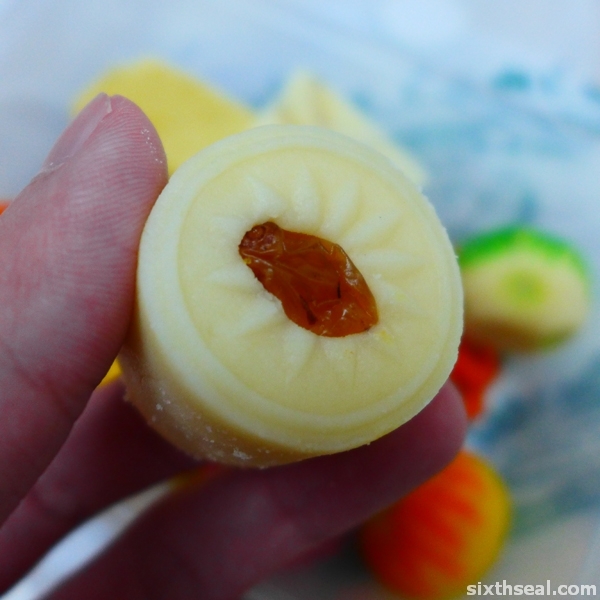 These sweets can’t keep more than 3 days anyway, so I usually hantam one go. I don’t have to sample it, but I can already feel the amount of sugar inside the desserts. It will definitely knock my brain out. I’m sticking to muruku. =D But, you might want to be careful there… too much sugar can lead to a toothache, HB. I already have really horrible problems with my teeth, unfortunately. Pingback: He’s back… | …Still crazy after all these years! I don’t know how to explain the area – I’m quite bad with directions, but I know how to turn in. 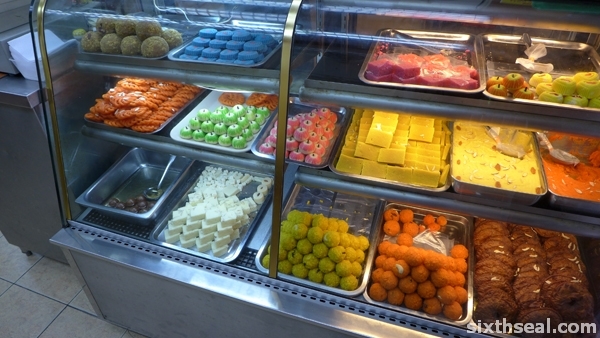 I’ve been looking for a really well stocked Indian sweet place and this is the biggest one I’ve seen to boot. They’re a vegetarian curry house actually. Oops, I was referring to Jangiri, that is! Just realized I didn’t say. Jangiri? You mean the orange donut like confection? Or is it a place?